It’s been a busy week, you’ve all worked hard, and it’s time for an after-work drink – just one or two, then home. Now fast forward and it’s later in the evening than any of you had planned. What’s a gang to do? Well, that’s pretty obvious – settle in for an after-after-work-drinks dinner. At King Street Wharf, you’re spoiled for choice. So go on – make a night of it. 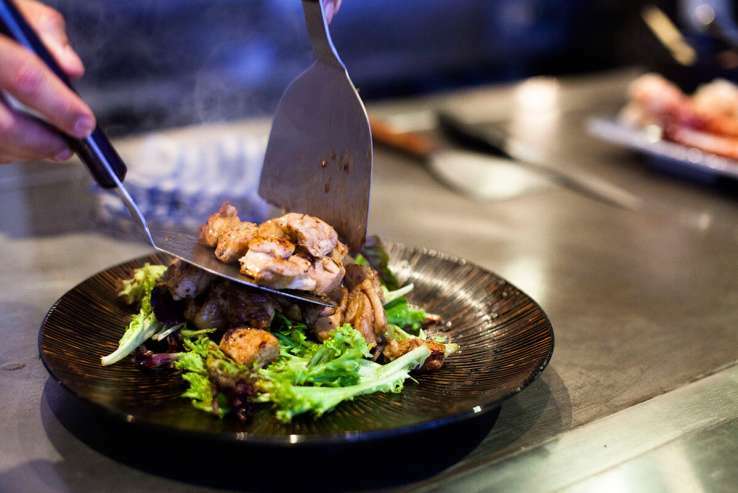 Come together at Casa Ristorante Italiano to share a slice or seven of flavourful, Sydney-famous wood-fired pizza that will hit every spot there is to hit. All the classic Italian favourites are catered for, as well as special delights like the frutti di mare, which is scallops, citrus-infused prawns, smoked salmon and rocket; and the Pizza Casa, which is… a secret. As they say on the menu, “we can either tell you the toppings or simply surprise you”. Who doesn’t love a surprise? Pair it with a side salad like the the insalata di polipo (octopus, potatoes, celery, cherry tomatoes, parsley, garlic and lemon) and you’ve got yourself an Italian romance. 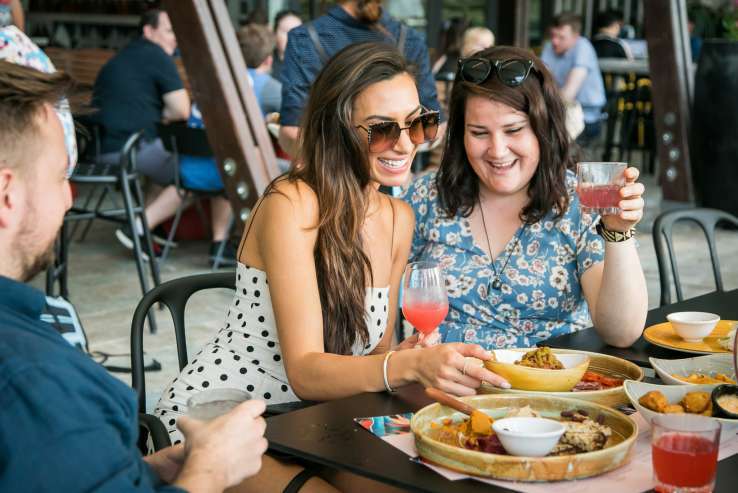 There’s nothing like mezze with mates, and Georges Mediterranean Bar & Grill has it on lock. Order for the table and indulge in dishes like grilled haloumi, compressed watermelon and mint; baked feta in filo with honey, oregano and sesame seed; marinated octopus salad with cucumber, fennel, radish; and deep-fried squid with zucchini fritters, aioli and lemon. And that’s just the tip of the Parthenon (…we mean, menu). Plus, if after all that food you feel like another little tipple, there’s ouzo for all and a baklava martini that will have you dreaming of Athens. 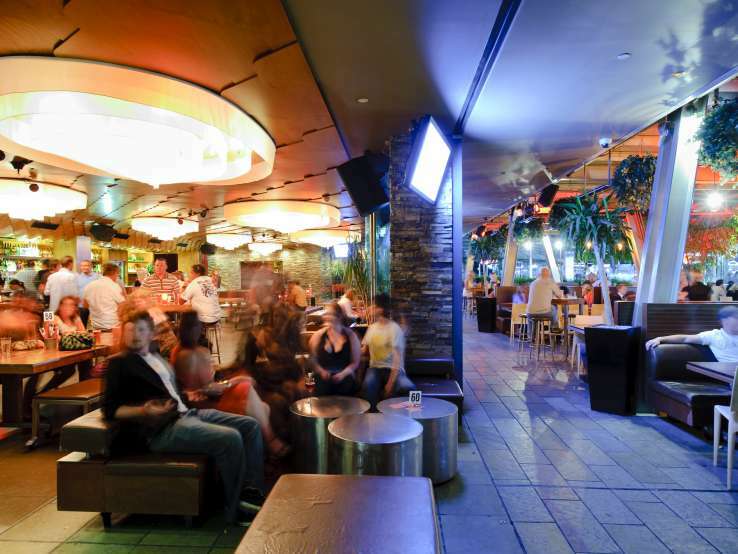 One of Sydney’s most famous purveyors of fragrance and spice, The Malaya is an after-after-work-drinks delight. The laksa is famous across Sydney, and their szechuan serving – marinated pieces of chicken thigh fillet, beef, eggplant or tofu stir-fried dry style with shallot, cashew nuts and dry chillies – with have all mouths watering. Try the Malayatini while you’re there – with lychees and Panama passionfruit, it’s summer in a glass. Is there anything better after a few drinks than a good, beefy burger? While it’s hard to go past an old-faithful like, Meat District Co.‘s The Old Faithful (grass-fed beef patty with mixed greens, tomato, caramelised onions, pickles, and house sauce), adventurous palettes can try the Surf & Turf (grass fed beef patty with marinated chilli crab prawns, mixed greens, tomato, and lemon caper aioli) or the grilled swordfish burger, with fresh tomato, lettuce, and griche sauce. Perfect for soaking up a schooner or two. Speaking of schooners, at Beer DeLuxe there are over 150 brews to choose from. Of course, you’ll want to get some dinner into you first. Hunker down on good old-fashioned pub food with a twist, like the cider-battered fish and chips with lemon and tartare sauce, the szechuan fried squid, or the Korean hot wings with pickled radish. Okay, now you can have another drink. Kobe Jones’ philosophy is all about ‘graze dining’, which means all dishes are served share-style, with portions designed to be shared. After all, sharing is caring. So what do you care for tonight? Maybe giant robata prawns (wild caught South Australian king prawns, flayed then cooked in the shell on the robata, basted with motoyaki sauce and served with lemon infused salt and prawn chips)? How about miso macadamia Patagonean toothfish (Glacier 51 Patagonian toothfish with buttered macadamia crust, delicately basted with yuzu miso sauce)? How about the whole menu? Share the love. Now, if you’ve had a few drinks you really can’t go past a good, hearty steak. 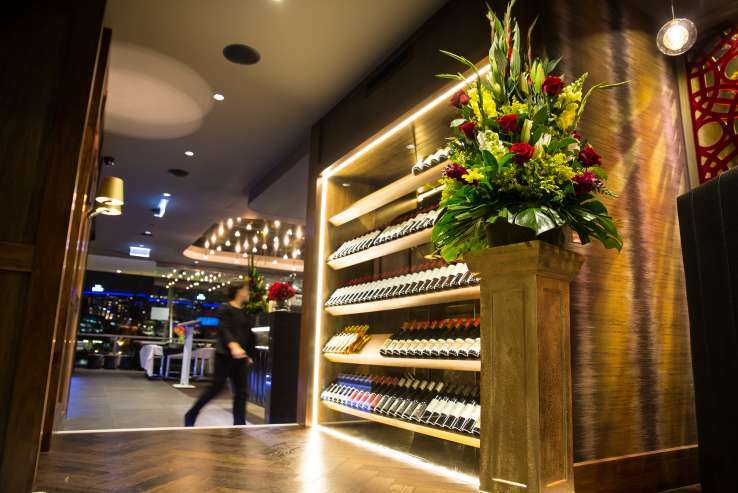 At Steersons Steakhouse you have a wealth of choices, with 15 different steak varieties ranging from a Riverina pasture-fed young beef fillet mignon, to the Rangers Valley 400-day grain-fed Wagyu rib-eye (MBS 6+). Complement your mouthwatering steak of choice with a side like sautéed garlic mushrooms or harissa roasted pumpkin with toasted almonds and aioli, and you’ve got yourself an after-after-work-drinks dinner to die for. Settle in around the teppan at Wharf Teppanyaki and watch that smoke and sizzle! Go for a set menu that’s designed to delight, like the Tsu Tsu Mi, the Deep Sea, the Beef Lover (aren’t we all) or the Western Rock. Shake it up with extra steamed oysters, Hokkaido scallops, pacific squid, and a hot mushroom salad to put even more fire into your after-after-work-drinks dinner. Now we’re really cookin’! After you’ve had a few, there’s nothing like fresh flavours and fresh seafood. Indulge in Nick’s Bar & Grill’s Sydney rock oysters – Kilpatrick, Mornay, and of course, freshly shucked – sizzling garlic prawns; seared scallops with fresh apple remoulade and an apple glaze; or go the whole hog (er, fish) with a seafood platter to share. With fresh chilled Balmain bugs, steamed and marinated mussels, fresh ocean king prawns, blue swimmer crab, freshly shucked Sydney rock oysters and Tasmanian smoked salmon, dinner is sure to go swimmingly. Spice up your life – and your night – at Manjits @ The Wharf. Do not go past Manjits’ famous preparation of tender, boneless lamb with fragrant Kashmiri gravy Goan beef vindaloo. The slow-cooked meat is rested in malt vinegar and garlic, cooked with pepper, cinnamon and fresh red chillis. For something a more mild but just as mouthwatering, the jhinga malabari is a smooth delight, with lightly sautéed tiger prawns finished with a creamy coconut reduction spiced with carom seeds, capsicum and fresh lime. It’s an after-after-work-drinks dinner fit for a king, a queen, and the whole office team.